Jinxy Knows Best: Protect Your Bananas! A banana is a great portable snack (it even comes in its own case to keep it clean), but there is one drawback. If you throw it into your backpack or tote to eat later in the day, any amount of jostling can turn it into a spotty brown and mushy mess. This solution might sound a little nutso, but it's really simply and absolutely works. 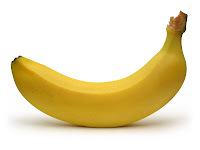 When packing your banana in the morning, just take a piece of bubble wrap (the kind with small bubbles) and wrap it around your banana, securing with a piece of tape or a rubber band. Your banana will stay safe and yummy and you can go ahead and reuse the bubble wrap the next day. Find more great Works for Me Wednesday posts. how funny! I never would have thought to do that! What a simple solution!